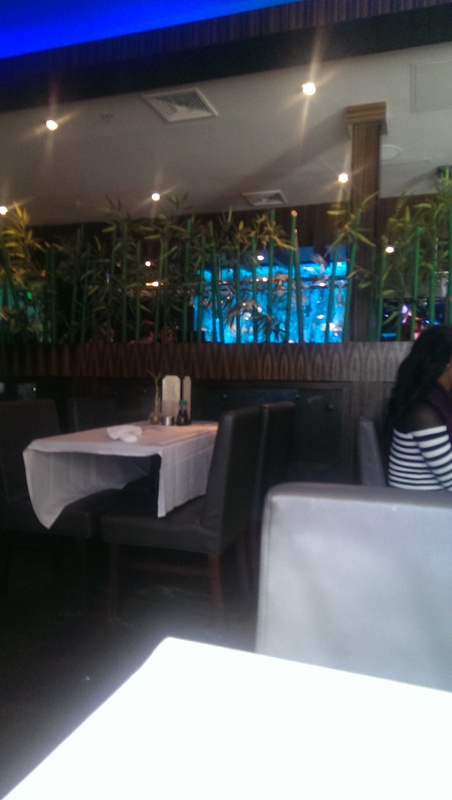 Wasabi is a Japanese sushi and steakhouse that has several locations in the area. I have been visiting the one in Beachwood, since it is the closest to me. It occupies the building that used to be the Olive Garden. It features hibachi on the one side of the restaurant and sushi on the other (although you can order a hibachi meal on the sushi side). The two halves are separated by a giant bubbling aquarium. My first visit was because I was craving sushi and was in the area. I was seated quickly and had a nice view of the aquarium. 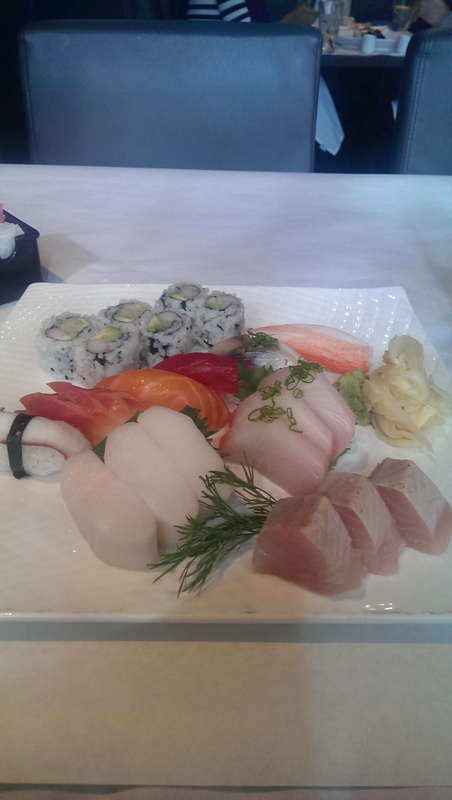 I ordered the Sushi & Sashimi Combo, which features six pieces of sushi, nine pieces of sashimi and a California roll. It was delicious. The sushi was fresh and tightly rolled. The accompanying miso soup was good, with some shittake mushrooms. The ginger dressing on the salad was bright and creamy. My second visit was on New Year’s Eve with my nieces. They were spending the night with me and asked to go to a hibachi for dinner. 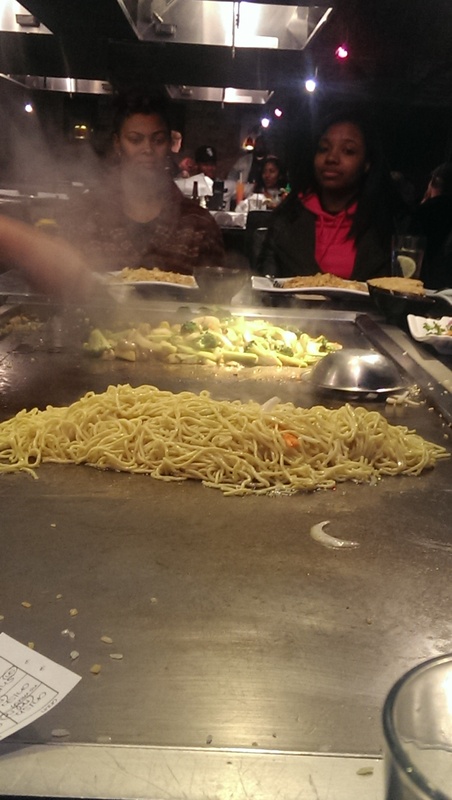 We have been to Benihana and Otani in the past, and my nieces enjoy the show and the food. I also knew they would enjoy the koi pond and the waterfall as we walked in. We went at 5 PM to avoid the dinner rush, and it was packed with waiting diners when we left. 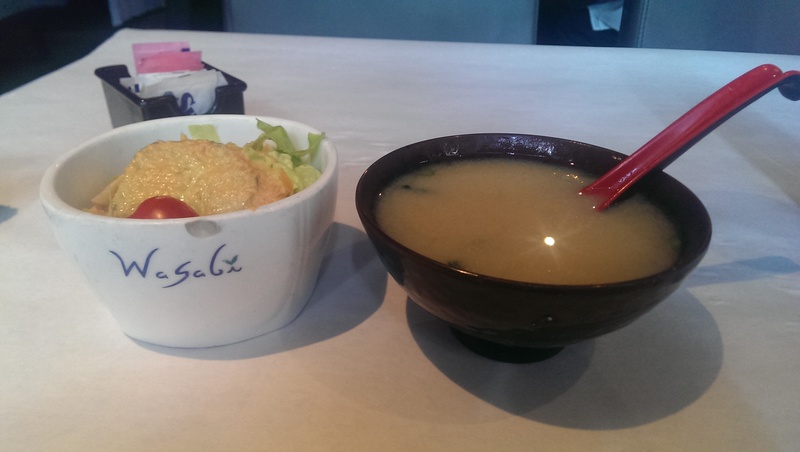 They really loved Wasabi, because they serve fried noodles in addition to fried rice. 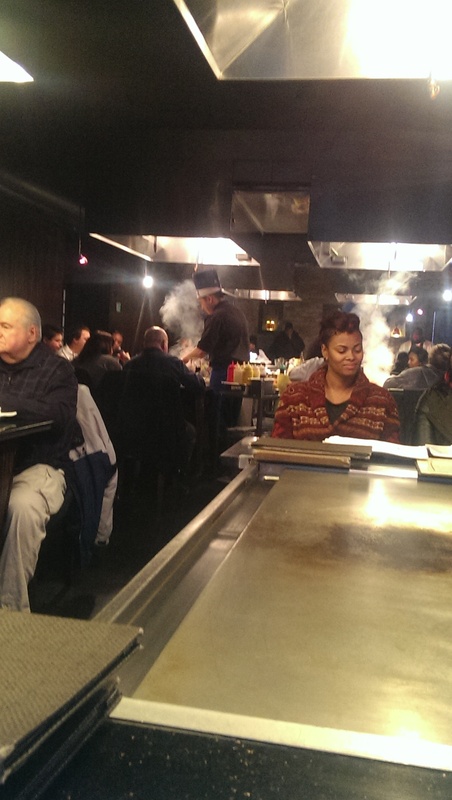 The service was pleasant, the hibachi chefs were very entertaining, and the food was delicious. The hibachi entrees also come with the soup and salad (except for the children’s menu, which offers a choice between them). My youngest niece ordered the chicken hibachi on the children’s menu. I t was a very decent sized portion and yet very affordable. My oldest niece ordered the adult shrimp hibachi. She snarfed down the fried rice almost before the shrimp was finished, and I ended up stealing some rice from the youngest niece’s plate for her. 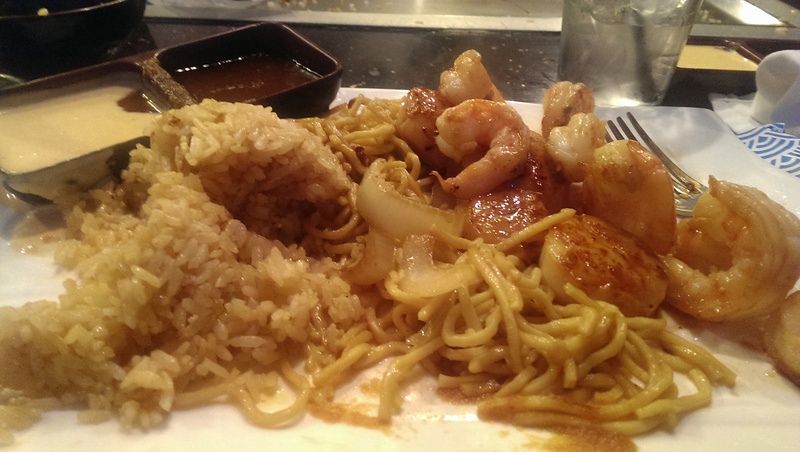 My shrimp and scallop hibachi entree was perfectly cooked. The fried rice and lo mein noodles were very flavorful and filling. I loved the assortment of vegetables they added to them. The chef was also generous with the yum yum sauce, which was a nice addition but not absolutely necessary due to the flavor of the food itself. We left with plenty of leftovers. Several of the diners at our table ordered extra fried rice since the portions are so generous. That probably gave them an additional full meal the next day. My only word of warning is to doublecheck your receipt against your credit card statement. Somehow there was a $15 tip added to my bill despite the fact that I left $16 in cash and remember sitting there and waiting for the change and that the impression of my total and signature on the restaurant copy transferred to the receipt I have. It was a busy night and “mistakes happen”, but it doesn’t hurt to be careful. It isn’t going to stop me from going there again in the future, but I will be writing CASH in huge letters on my receipts from now on. The manager also refunded the money to my credit card without question (but not much of an apology).